Roof - the most important part of any building, premises because it provides protection from external climatic influences, being exposed to the highest loads. Roofing must equally well to withstand the heat and cold, dry weather and high humidity, strong wind and big snow, stay waterproof for decades and providing reliable thermal insulation. Particularly high requirements for reliability, durability, and functionality are presented for the roofing of buildings for industrial and commercial applications. Largely roofing quality depends on the materials and components, but most of all - the quality of the installation work, especially connecting devices of different nodes, junctions, and interfaces. It provides quality installation efficiency of coverage - saving thermal insulation and waterproofing properties - throughout the entire lifetime of the building and any structural errors and violation mounting technology will eventually lead to the inevitable losses and additional costs. Therefore, design and installation of roofs, especially in buildings for industrial and commercial applications, it is necessary to trust only the commercial roofing contractors with extensive experience in implementing this type of work. If you intend to construct a new commercial building or planning the replacement of an outdated commercial roofing on an existing building, There are many commercial roofing solutions, and each has unique attributes and benefits. So in this article, we will show your our guide for commercial roofing systems to find the best solution for your roofing. Today, let's take a look at the commercial roofing systems which installed on top of flat or low slope buildings across the world. Reinforcement, which adds strength, stability, and dimension. 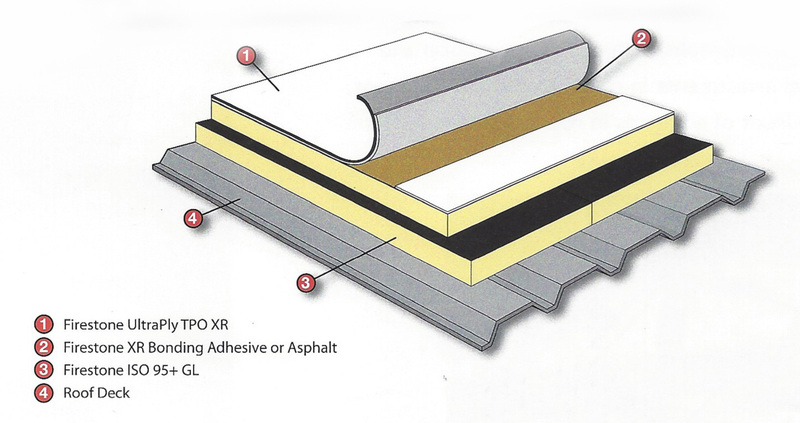 Waterproofing layers, arguably the most critical part of a roof to guard against rain or water. Surfacing, which exposure to the sun’s UV rays and protects the other two layers from the outdoor elements. As is seen with commercial roofing systems, some roofing systems’ surface layers have additional benefits. Although commercial roofing structures are similar in many respects residential structures, commercial structures have their own special characteristics. That is why commercial roofing materials must be carefully selected. One of the obvious features of commercial roofing is that they are generally larger than residential. Therefore, the challenges that come with commercial roofs are more serious than any other type. The materials used to build roofs for commercial roofs must be carefully selected so that they can meet the requirements of a standard roof. When it comes to this category, you do not just choose any kind of material. Although there are factors such as cost and availability of what affects their choice probably you should ensure that the one you choose is appropriate. One of the most basic and waterproof effective ways is a commercial roof with a single layer membrane made of a mixture of a synthetic polymer. These membranes can be cut to fit the shape and contours of the individual roof. Some roofing membranes polymers also have insulating properties to help reduce the costs associated with heating and cooling the building. That's why polymeric roofing membranes are used. With these materials, comes with waterproof roofs is not a problem at all. Usually, it is made of a membrane having a single layer and which is made of a synthetic polymer hybrid. To add to waterproof, easy to install and withstand extreme weather conditions. Asphalt is a more traditional roof material. Roofers begin with a base of polyester or fiberglass felt, then apply layers of asphalt, gravel, and glazing. Due to its multi-layered approach, this type of roof is called a roof built. Asphalt built-up roofs are waterproof, hail and even fire. Asphalt is another classic material. The roof is usually made with several layers so it is one of the strongest options. If the roof is built well, it can last a long time. It can also withstand heavy rains and can be completed in a very attractive finish. This roof is very strong and can be used if you need more security for their stores. 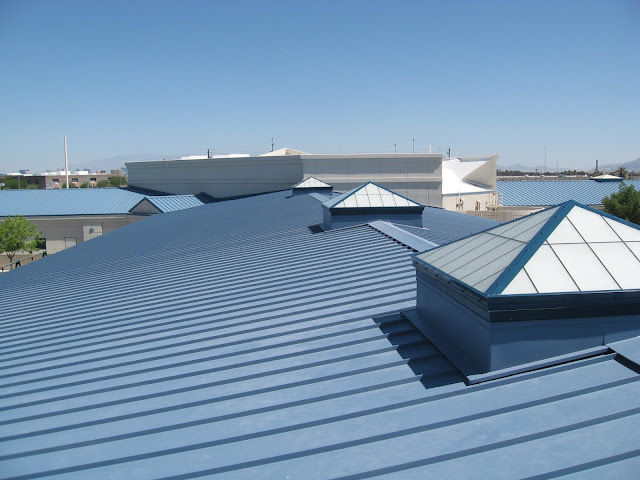 Metal is another material used in some projects to high-end commercial roofing. The metal has a long shelf life and comes in a variety of colors, making it easy to customize to any style of construction. Some products have metal ceiling tiles or patterns that simulate slate, while others have a more modern look. Metal roofing products are also recyclable, so better for the environment. Metal is easily customized to suit a variety of buildings. There are many ways in which the metal can be used as a roof and they are used in commercial roofs. This is one type that has been used since traditional times and is still popular among many developers. One of the most remarkable qualities is that metal can last incredibly long and withstand high temperatures. It is also a light cover which means that it may be preferable for weak foundations. To add to that, it is cheap. Shingles are another option for commercial roofing. They are built similarly to a roof construction, using a wood fiber or glass fiber base and a coating of asphalt, however, rather than applied as sole cover tiles are attached one by one, forming a pattern of the overlay. Shingles are common on sloping where help dissipate rainwater ceilings and also serve as protection against hail. Shingles come in a wide variety of basic and design styles. Natural slate roofs are an extremely durable material choice for elegant shopping roof, natural slate roofs have a classic look and can last hundreds of years. The board comes in a variety of colors, thicknesses, and sizes, allowing roofers customize a slate roof for any type of building. Slate is naturally repellent to algae and fungi, which means less cleaning and maintenance is required. Thermoplastic polyolefins (TPO) generally refer to a kind of plastic used in a variety of markets and applications (especially in the transport sector, including plastic parts both inside and outside the car). They are also used for the manufacture of membranes for roofing and insulation for electrical cables. The TPO roof system is generally injection molded into the desired material, but there is increasing use of the thermoformed sheet and profile extrusion and other processes. The TPO roofing system is generally produced by blending polypropylene (PP) with elastic ethylene (POE or polyolefin elastomers) and adding other fillers and additives. Mixing specific quantities depend on the overall balance of properties to meet the performance specifications and desired processing equipment used for the application. Polypropylene (including homopolymer, impact copolymer, or other), that provides temperature stability and rigidity. Elastomers which provide impact resistance and flexibility. Talc or other mineral fillers (eg glass fiber or carbon ) which impart high rigidity and dimensional stability to the workpiece. Additives for ignition resistance, scratch, and seawater to improve end-user performance and durability. Rigid TPO made, mostly with a polypropylene component with added ingredients to achieve an overall balance of properties. The development of rigid TPO formulation begins by selecting an appropriate PP and adding only the minimum level of modifier to achieve acceptable ductility while maintaining the rigidity (as measured by flexural modulus) as highest possible. Resistance to biological and chemical attack: The TPO membrane production technology used antifungal composition of the new generation so that the membrane is not subject to little or no biological effects. One of the best features of TPO roofing system is its environmental benefits. A white TPO roof helps reduce the amount of energy that is required, thus lowering energy costs. Less energy consumption equals, directly contributing to a cleaner environment. This also helps in reducing the urban heat island effect. TPO roof systems have a cleaner manufacturing process, contain no chlorine and are recyclable. Ethylene propylene diene monomer rubber is a form of synthetic rubber used for many purposes. EPDM Roof containing the same properties of natural rubber, but is highly favorable. 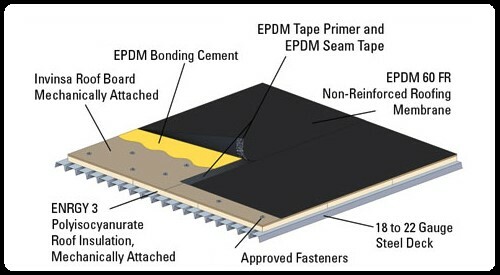 EPDM is an elastomer consisting of ethylene, propylene, and diene, therefore the letters in their name. The M in its name comes from the ASTM classification, indicating that chain has saturated the type of propylene. Depending on the make EPDM rubber roofing may contain between 45 and 75 percent ethylene content. 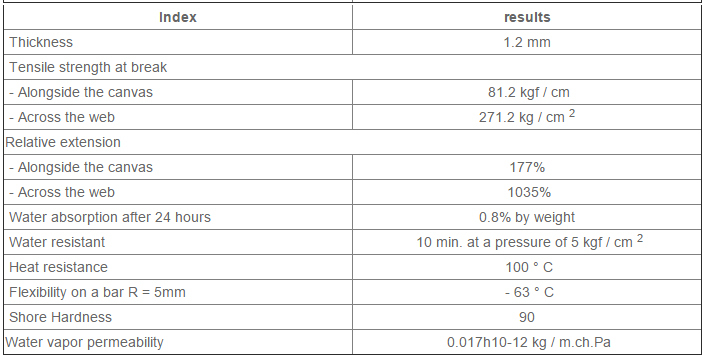 The higher the ethylene content, the easier is to mix and load the polymers during development. EPDM is mainly composed of ethylene and propylene. A small amount of diene is added to it, which causes the rubber to increase flexibility. It can be stretched much longer returns to its normal size and shows no signs of deformation. EPDM is resistant to aging properties, is extremely resistant to temperatures and weather conditions, and has a high resistance to steam and water. It also stands and UV, oxygen and other common chemicals that rapid natural rubber wear. EPDM rubber roofing also works great as an electrical insulator. The absence of sensitivity to the bituminous material. One of the most attractive benefits of EPDM roofing membrane is its ability to be easily repaired. The makeup of EPDM rubber roofing is such that, even after many years of maintenance, repairs and modifications can be accomplished with successfully and easily way. 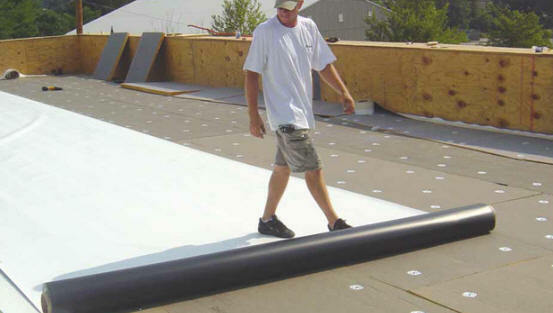 Due to its excellent waterproofing capabilities, a rubber roof can be easily washed and prepared for an adhesive application or the installation of new material. EPDM roof is used in many applications, it is commonly used on rooftops, as it is highly resistant to water, it is safe and is stronger than traditional rubber. EPDM roof coating is also used in heating systems of swimming pools. Many common items are made with this type of rubber, including garden hoses, washing machine parts, safety devices and auto parts. In addition, low-pitched commercial roofs, you may see EPDM is used as the cover material of gardens rooftop. Other uses include pond liner, RV ceilings, tunnels and foundations. Photovoltaic systems (solar photovoltaic panels) on a large scale is the union between a panel of photovoltaic cells which convert the directly energy of sun into electricity. The inverter converts the received energy into high-quality single-phase voltage for domestic use. The solar cell (module panel) is a photovoltaic generator, the principle of action is based on the physical properties of semiconductors: light photons knock electrons from the outer shells of atoms. With the closure of the circuit an electric current. Solar cells are connected in a circuit in series or parallel to obtain the required parameters for current and voltage. Increasing the area of construction of the installation, you can create any power. 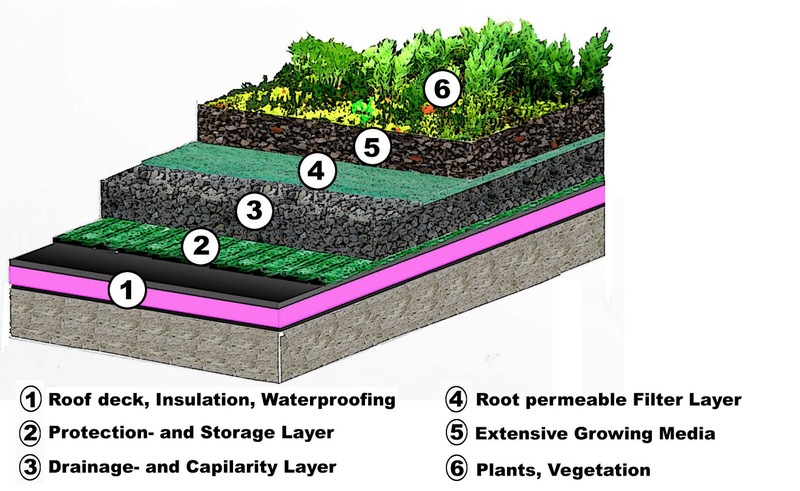 Green roof system is the roof of a building that is partially or completely covered with vegetation, either in soil or in a suitable culture medium. It does not refer to green roof, as that color tile ceilings nor to container gardens. It refers instead to technologies used on roofs to improve habitat or saving energy, ie technologies that serve an ecological function. Topsoil (made by plants, grasses and flowers will be planted on the surface). Material for plant growth (usually a nutritious mixture of nursery land and other organic compounds). Drain layer and collecting rainwater (composed of sand or other large grain materials that allow the passage of water but no other solid compounds or channeled and stored for later use). Waterproof membrane (stops the passage of water and humidity to the structural part of the roof). Green roofs can insulate commercial buildings by preventing heat from moving through the roofing. Technological advancements have allowed green roofs to do much more, including absorb rainwater, lower urban air temperatures and combat heat island effects. Cost of plants, fertilizers and furniture required. Cost reduction heating and air conditioning of the building (the green roof acts as a cushion climate, which retains heat in winter and keeps the interior cool in summer environment). Before starting the implementation of any green roof was to meet existing classes to select the most appropriate in each case; as the design, construction, maintenance and evolution of the roof shall be subject to the kind of roof is to be implemented. Traditionally green roofs were classified into three different types depending on the depth of the substrate and the maintenance requirements: Intensive, semi-intensive and extensive . And these are the main types mentioned commercially. But in addition to these three classes is another, the cover " biodiverse "which shares many of the characteristics of an extensive cover. In addition, within some of the major categories, we are also subclasses. As already indicated in vegetated covers a green cover (also can be called living cover) is a roof deck or roof (or any other surface structure of a building) on which the vegetation grows artificially or settle, too artificially habitats for wildlife development. Extensive green roof system act as a layer with ecological functions, which has benefits, both environmental and economic costs of maintaining the building where it implant (serve as thermal insulation). This system is the lightest of all and cheaper. Still best to install on roofs or in inaccessible steep slopes. They are characterized by fairly light, with a substrate of reduced thickness and low concentration of nutrients. Suitable for such plants covered with some species of sedum, some perennials and grasses. Overall resistant plants with few requirements for water, fertilizer or the addition of nutrients beyond those obtained naturally from the substrate. Once established vegetation, require minimal maintenance. These systems are well in renovation projects and for large areas because the plants used are rapidly growing and create areas of dense vegetation. Designers can incorporate water retention systems design to reserve rainwater for irrigation of planted species and encourage their development. These substrates installed thin allow to collect about 2.5 cm sheet of water after a rainfall event. The soil mixture used for growth has means percentages: 70% of type expanded slate rocks, 20% sand and 10% organic compost. With a thickness between 8 and 10 centimeters and holds a load of 120 to 150 kg / m². Usually no problems weeds or invasive species while the proportion of organic material is not excessive. While the potential for biodiversity is very limited. This system can be installed very well by modules. Extensive light: characterized by low potential of biodiversity and the minimum holding capacity rainwater. Extensive super-light: very thin layers, the drainage sheet is only 12 mm and the layer of vegetation only reaches 25 mm. Plant diversity is very limited and tend to dry. Installing intensive green roof is comparable to the construction of a garden in a deck and providing similar to domestic gardens or parks small benefits. So often also they called the green roof. Since the plant variety is broader than in extensive layers require higher structural loads and thicknesses of substrate to retain more water and keep the vegetation. In addition, maintenance must be periodic, with common tasks like gardening and mowing, fertilizing, watering or weeding. Often they placed on underground car parks or on top of shopping centers (in the US of course) who want to include a play area. These systems require regular watering, and an elaborate drainage system. They are multifunctional, but are mainly designed to give them a recreational use. These covers are generally accessible to the public and more expensive to maintain annually. Many of the designs of these covers include the management of rainwater and even some of re-circulation systems for irrigation runoff. Intensive green roof is the one that provides greater isolation, which is an advantage in reducing the energy consumption of a building. Also, they filter and purify the air and urban rainwater that sometimes creeps contaminants in precipitation, which has great environmental benefits. 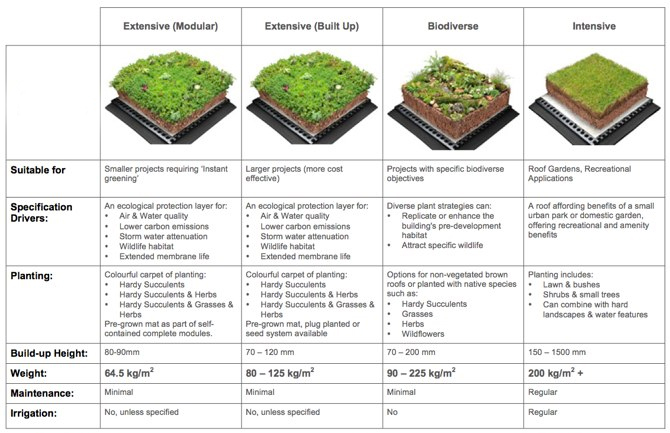 The features of the semi intensive green roof are a combination of those associated with intensive green roof and extensive green roof, with an average depth of between 120 mm and 250 mm and some maintenance needs. This system is ideal for fine roofs are partially accessible. Often they included in roofs with a social-recreational use so that landscape features are added to make them more attractive. Usually these systems are installed on roofs of metal or concrete / cement which can withstand overweight and waterproof membrane. A semi intensive green roof is characterized by a higher plant variety, compared to extensive systems. You can support herbaceous plants, grass or small bushes. It requires moderate maintenance and occasional watering. This will depend on the selected plant species. This system can hold more water storm extensive indoor and provides greater ecological wealth. The mixture comprising this type of light substrate consists of a 55% expanded slate rock type, 25% sand and 20% organic matter and can retain 1-3 cm of rainfall. It is important to ensure that there is good drainage for the plants and their root systems are sufficiently ventilated. In case there are limitations to water these covers are perennial herbaceous species that can overcome these limitations.